We offer an exclusive assortment of all types of Anti vibration Mountings-vibration mountings that is available in various specifications as desired by the clients. These are engineered using finest quality raw material that is procured from the reliable vendors of the industries. Our mounts are suited for mounting workshop machinery, without being anchored to the ground. 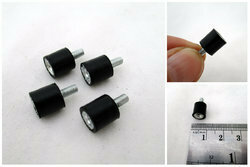 Looking for Antivibration Mountings ?